You know how some homes have one of those really large globes sitting in the living room, showing off where each country is in a much, much scaled down version of the spinning ball of molten rock and lava that we live on? Well, why not accord the same honor to other planets in our solar system as well (sorry, Pluto! ), with the gas giant Jupiter taking center stage in the form of the $144.99 Jupiter Solar Spinning Globe. 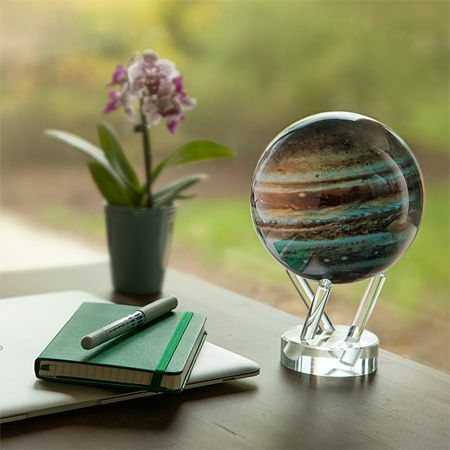 The Jupiter Solar Spinning Globe might be able to pique the interest of your little one when it comes to future space exploration, where it comes in a 4.5″ diameter globe that depicts the massive Jupiter. Its rotation will be powered by low-light solar cells, although in the real world, it is a whole lot more complicated than that to have Jupiter orbit around the sun. Definitely one of the more mesmerizing things to occupy your time with at the office or at home if you’re bored, or need to take your mind off some serious matter at work. The equatorial bulge and planetary rings are not included, so do take note of that.